Instant Replay Review overturned 3B Umpire Bill Miller's foul ball call in the top of the 5th and upheld 2B Umpire Jim Reynolds' safe call in the bottom of the 6th inning of the Giants-Rockies game. In the 5th, with one out and one on, Giants batter Tyler Colvin hit a line drive towards the left field foul line. 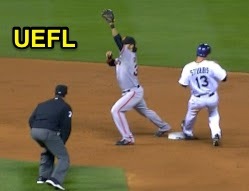 Upon Replay Review as the result of a challenge by Giants Manager Bruce Bochy, Miller's ruling was reversed and runners were placed at second and third base as the result of spectator interference, the call was incorrect. At the time of the review, the Rockies were leading, 1-0. In the 6th, with none out and one on, Rockies batter DJ LeMahieu bunted a 0-0 slider from Giants pitcher Madison Bumgarner to Bumgarner, who threw to shortstop Brandon Crawford as Rockies baserunner R1 Drew Stubbs arrived at second base. Upon Replay Review as the result of a challenge by Giants Manager Bochy, Reynolds' ruling was affirmed, the call was correct. At the time of the review, the contest, was tied, 3-3. The Rockies ultimately won the contest, 5-4. This is Bill Miller (26)'s second Replay Review of the 2014 MLB Regular Season. This is Jim Reynolds (77)'s 11th Replay Review of the 2014 MLB Regular Season. This is Crew Chief Bill Welke's 20th, 21st supervised Replay Review of the 2014 season. This is the 323rd, 324th Instant Replay Review of the 2014 MLB Regular Season. This is Giants Manager Bruce Bochy's 10th, 11th Replay Review of 2014. Umpires are now 169/324 (.522 Affirmation Rate) in Replay Reviews during the 2014 MLB season.